Thank you for joining us in praying the St. Jude Novena! If you’ve had any of your prayers answered during this novena, please share those with us all below! Thank you St. Jude for an answered prayer! I got a job that I prayed for. I am requesting for your continuous guidance for me to be successful in this new career. Thank you Praise the Lord Jesus Christ! Thank you Saint Jude for answering part of my prayer last November. About a month after praying the novena in October, they accepted an offer that was made on their trailer. Thank you again Saint Jude for bringing someone to buy their trailer. Thank you St Jude for helping me with my studies and passing exams that were so difficult. I know I would never have come this far without his help, guidance and blessing. I prayed the St. Jude novena for my husband to get a job and thank the Lord it helped. Thank you St. Jude for answering my prayers. Thank you St Jude for restoring our relationship. I will always be grateful to you. Thank you St Jude for helping me with my studies and ultimately helping me pass an incredibly difficult exam. It helped restore my beliefs- not in God- but in myself. Praying this novena also hit the prayers you hold in your heart. I had one as a long time friend who is not much for God and isn’t catholic but his wife is. His wife called me a couple of days after this novena and asked me to write a support letter for my friend. He was attending a men’s retreat for Christians that want to learn more about the Catholic faith. I wrote a letter and he went. Where will it lead? Hopefully it will bring him to the Church. His wife and I always thought he would only come kicking and screaming. Praise Jesus and thank you all for praying for him. Please pray for my son Danny who is taking drugs. I am very worried & pray for his healing. I just recently lost my boyfriend of 7 years. I want to try and work things out but he says he needs time. Please help him to have a change of heart, so that we may be at peace. This peace will help us work out our differences so that we may be reunited once again. I have been praying for a job..not yet answered but I believe through St Jude novena my wish will be granted.. please my dear friends remember me in prayers. Dear St Jude ,I want to thank you for the past favors. I ask you to heal my broken heart and uplift me. Please heal all my broken relationships and renew my life. I promise you I will share your name with love and honour. Thank you for listening to my prayers. Fulfill my heart desire. Amen. My prayers were answered as all three of my children have done well in school. They went into finals with much less anxiety. Thank you for all you do and continue to do for my family! My husband and I had been house hunting for a while, and it had started to take a frustrating and stressful toll. We didn’t know if we should keep looking, or postpone searching. One of my intentions for this novena was that we would find the “right” house. The day after the novena finished, our agent let us know that she had sent a mass mailer to all the residents of a subdivision that we really loved, asking if anyone was planning to move in the near future. We had no idea she was planning to do this. She said that she had gotten a response from one couple, and they said that we could come see the house that week. As soon as we walked in to the house, my husband and I both looked at each other and knew it was the right one. Thank you St Jude for helping us in a situation that had begun to feel hopeless! Thank you St Jude. My prayers were answered but in a different wzy. Thank you so much! Iam really greatful my prayers for a job in is been Answered. Thank you St. Jude for your prayers. I have received approval for a second mortgage with reasonable monthly payments. I was recently in New York and visited St Patrick’s cathedral. The only place I was compelled to light candles was at St Jude’s station. Mt Grandma used to pray to St Jude all the time and I guess I have always felt a connection. Since that day I have seen signs of St Jude this novena starting shortly after being one of them. For the first time in a long time I did something selfish and I prayed for me as my intention. My life at work has become difficult at best and I have allowed my health to suffer as a result. So I prayed that I would not become a hopeless cause and for St. Jude to give me the strength to be successful in my daily life. In the 9 days that I prayed I have felt better I have been motivated to start working out again and I have forced myself to see the lighter side of what sometimes seems to be impossible situations at work. I know some of this is my mind set but I also know that St Jude and my grandma are rooting for me to be the best me I can be every day; in this respect my prayers have been answered. Thank you for sharing this novena. I have been praying for good weather and a successful fundraising event for the foundation I am a member of. Thank you, God and St. Jude! Thank you for sharing this novena with all of us. I have been praying for my son and daughter in law, for their difficult financial situation right now. I asked St Jude to provide a financial solution and the day after the novena my daughter in law shared that my son was offered a permanent position at the temporary job he has been at for 2 months. Praise the Lord and St. Jude! And all of the Saints! We just found out today that my mom’s cancer did not spread! We are rejoicing! Thank you so much and we are so greatful, thankful and feel so blessed! Our prayers were answered! God Bless the world and everyone who needs prayers answered! Please Lord, St. Jude and all of the Saints, that everyone’s prayers will be heard and answered! Amen! God Bless! I have been praying that my business which I have recently started may pick up and be stable. Thank you God, I believe my prayers will be answered. Amen. My prayers have been answered! I prayed this novena with the intention of finding a job. During the novena, I not only received one job offer, but I am still in the runnings (interviewing) for another potential job offer! Both jobs are exactly what I want to be doing. I could not be more grateful to God and St. Jude for watching over me, helping me, and answering my prayer! Thank you St. Jude and God! Thanks to St Jude for attending to novenas. We sold our home. After a month with no one showing any interest, all of the sudden we had several interested and finally a contract. Truly a blessing. Thank you St Jude, for your intercession. Thank you St. Jude for the healing of my beloved 96 years old father. His problem started when he fell in the bathroom and sustained a fracture in the bone in the groin area but needed no surgery, thanks to God. It turned out that may be he fell because he probably felt dizzy or lightheaded due to his low his hemoglobin as he had gastrointestinal bleeding from an old ulcer. While in the hospital they found out that he had also pneumonia and was given IV antibiotics. He was discharged after more than 1 week but lost his appetite and had not been eating for several weeks despite medicines prescribed to increase appetite. My brother was so concerned because he looked so skinny just bone and skin so he brought him again to the hospital for parenteral nutrition. His undernutrition was complicated with another bout of pneumonia due to his low resistance. He was so weak that his voice was hardly audible. After a week in the hospital he was discharged ( that was a week ago) and now he is almost in his usual state of health. He could walk by himself and even able to climb a hilly place without assistance. He is also eating as he used to. Thank you St. Jude for interceding for my father so that he could be healed by our loving God. With the guidance of the Holy Spirit, the doctors and those involved in his care did the right thing. Loving and caring people of God including family, friends, and all the health care prividers: doctors, nurses, his personal caregivers, etc. all contributed to his healing and fast recovery. I thank God for all of them and for giving us a powerful intercessor like St. Jude. St. Jude, please continue to pray for all of us! I got a new job!!! God is Soooooooo faithful. My niece had a job interview Thursday and she was hired. Yeah! Her mom is out of the hospital and hopefully will remain healthy. My nephew has not been drinking. Everything is looking up. They are going to start looking for an apartment. 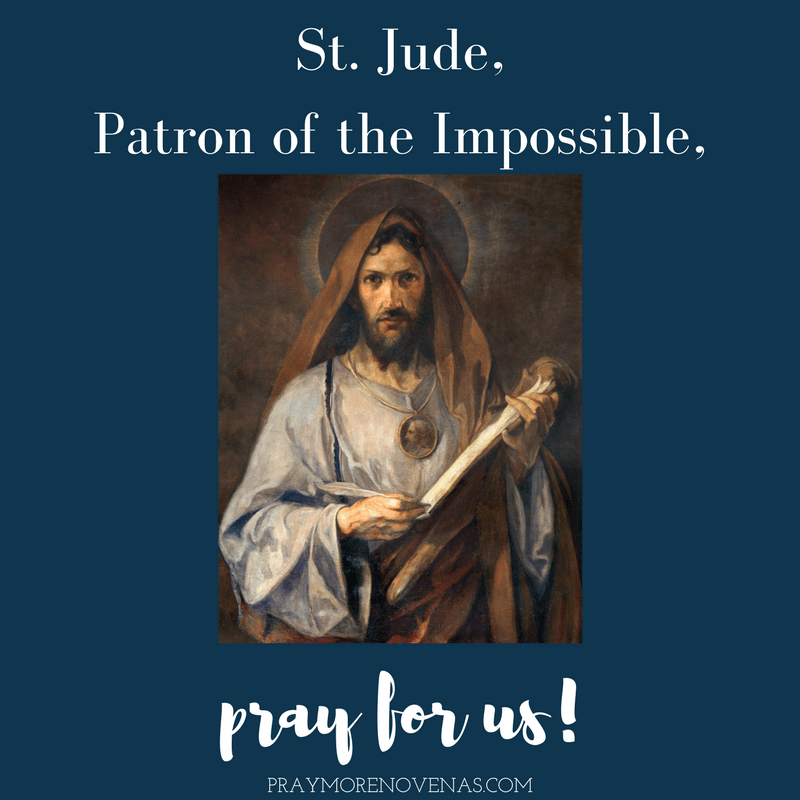 At this close of the St. Jude novena, it appears that the novena prayers have been answered. Thank you to St, Jude and all my prayer friends for this prayer to be answered. Thank You St Jude, my son has been shortlisted for a scholarship interview, my cv was requested for consideration for a possible job. I have been praying for my three-year -old grandson who is developmentally delayed. Today, he stood up on his own. My sisters and I prayed for our Dad who was in the hospital and wishing to come home. While his specific prayer wasn’t answered, ours was — that he would go to rehab before returning home (he didn’t want to go to rehab). Insurance initially denied rehab. In the end, Dad is very grateful. Dad was praying to St. Jude decades before any of us thought to do so. I didn’t do this Novena on the scheduled time because I was already saying others. But I prayed to st Jude on his feast day for clarity on a situation – without much fervor, I admit, because I thought the situation was done and closed – but he came through for me!! I had completely given up hope and he gave me the answer I needed! Thank you st Jude! I will follow up on my promise of saying a Novena to you on thanksgiving. I have been praying for my sons to return to Church. My youngest son was going through turmoil and asked God to give him a sign that everything would turn out for the good. His prayers were answered and my son went to Church this past Sunday and said he could not have gotten through this difficult time if it were not God showing him to have hope and faith. My son said he is coming back to Church but most of all he is thankful for God’s blessings and for answering his prayers. I know that God is still working on my older son to return to Church. And, as a mother I will continue to pray that he comes back to our Lord and to His House. God is good. I thank God for returning your son back to church. I’m also believing God to bring back my son to church and to help him through a problem he has at work plus encourage him to continue with his studies which he abandoned. I prayed for my son’s heart to heal, and he is feeling much better. I prayed for my husband’s depression and anxiety to lift, and he is definitely feeling more optimistic. I prayed for a friend with cancer who is responding well to treatment and is feeling better. Thank you for the answers to these and other prayers of our hearts, and I know the answer to my husband’s career needs will be answered at just the right time. Thnak you for your intecession, St. Jude. Thank you Lord! Thank you St. Jude, my diagnoses Friday was not as bad as it could have been. I prayed that he health of my daughter, who has a medical condition, to improve. For the past two years she has been very private about any testing and results. On Friday out of the blue she texted me letting me know she went in for lab work and for the first time, her tests came back showing her health was better than it was a year ago. I am so grateful. I’ve been praying for years for help with our financial debt and God has found a way, as only he can do, just in the “nick of time”. Thank you Lord for your blessings, give us guidance not to make the same mistakes again. Please continue to pray for us. This novena reminding me of the many “impossible” causes far beyond my own. It helped me become selfless during my prayer. Thank you for all the beautiful words. Even if my email shall be publicized there is no problem because GOD HAS DONE FOR ME GREAT THINGS THROUGH THE PRAYERS OF SAINT JUDE THADEUS BEFORE THE THRONE OF GOD. I THANK THE HOLY TRINITY WHO IS ONE GOD IN THREE PERSONS FOR ANSWERING ALL OF MY INTENTIONS WHICH WERE TAKEN TO HIM BY SAINT JUDE THADEUS. I SHALL NOT STOP PRAISING GOD NOW AND FOREVER BECAUSE ABOVE ALL, HE HAS PROVIDED ME WITH ENERGY TO FIGHT TEMPTATIONS. THIS REVEALS THAT HE IS LIVING IN ME AND I AM WITHIN HIM. THANK YOU FOR THIS SERVICE. I SHALL BE WITH YOU NOW AND FOREVER IN PRAYERS. Thank you Brethren for joining me in the last Novena. I’m very hopeful that God is going to answer my prayers through the intercession of St. Jude. I was rejected for a test round of employment application. But, last three days they came back to me and said they want to have an interviewing me. I hope I can secure a job and roll the interview thank you Lord Jesus..
No Prayer is too big or too small for You to answer Dear God. St. Jude I prayed that you would ask God if it was His will to let an estranged friend unblock me from his contacts ( it was the first time it happened and for two weeks) and for him to reach out. On day 7 ( Thursday)I kept saying to St. Jude “this is a simple prayer but my heart is so down and heavy because the friendship mattered so much before, so you need let him to unblock me even if we never spoke again”. I suddenly saw within that time I was so sad and in prayer the person unblocked me…. after 2 weeks. I started to scream with joy amazement everything at the way St. Jude always gets prayers answered. On day 8 which was Friday I was on the porch of my office with my back to the road , when I turned around the person had stopped his car asked how I was doing ,said that he was missing me!!! ( meaning our friendship) I almost passed out! But I had asked St. Jude to God to let him reach out to me if it was in alignment with His plan, God answered my prayer simple situation, but He knew how my heart felt. He saw me. Thank You St. Jude for intercession on my behalf and for all others who prayed this Novena in faith. You Are Patron of almost impossible and hopeless situations. Thank you God for every avenue You allow us to experience Your faithful Love for us even when we are unfaithful to You. I ask that You will continue to bless me and keep me centered in Your Truth. St. Jude I will honor you as my special patron and gratefully encourage devotion to you. I have been praying for my son to get a job, he has applied withso manycompanies. He is a recent college graduate with a mechanical engineering degree. I asked St. Jude to intercede for my husband to have a financial break through so that we could continue work on our home where money had run out , the house was then uninhabitable, tools stolen and stuff. We have been under tremendous strain. My husband then approached me and told me he had gotten approval for some money so that the work could go on and we would be able to move in in a few months. Thank You St. Jude for being a friend of Jesus approaching God through Jesus on my behalf. Thank You God for Jesus and Your Holy Spirit and all Your Heavenly support. I Love You God. Forgive me for falling short at times. You are my Eternal Lifeline. Thank you St. Jude for all you have done. I prayed for a successful Knights of Columbus project, namely a Trivia Night that is a primary fund raiser for us. Attendance had been dropping, but last night was better than most in the recent past. St. Jude, I’m grateful. Thanks! 1. Mom’s nurse commented today that she is a great deal better than she was 2 weeks ago. She showed no signs of illness when I visited her today. 2. I had also requested healing for myself. Yesterday, I experienced an uncomfortable heat in my back. I usually experience that when a healing is occurring. I haven’t determined yet what it was but have learned to trust that the Holy Spirit is working. Thanks be to God for HE truly answers all prayers. For those of us whose prayers has been answered, may God’s name be glorified. For those of us whose prayers has not yet been answered, keep faith in God for HE does not disappoint nor fail to answer but comes at HIS own time. Let’s just have faith in God and surely, all our prayers shall be answered accordingly.. Please pray that my children, husband and grandchild will return to the Church. Please pray that my sons will be married in the Church and raise their children in the faith. God bless all of you, and thank you St. Jude for interceding for all of us. Thank you St Jude, my prayers have been answered. My son had successful brain surgery last Monday that corrected a congenital defect that caused him a stroke. He is still in pain, but recovering well. I was i need of immidiate financial help and there was no way to get financial help but thanks to intercession of st. Jude i got the istead financial help .i truly believe that he is my patron. I have been praying this novena with my adult son for a specific requirement he must have before he can graduate from university. On Day 8, the Lord, through St. Jude’s powerful intercession, answered our prayer. So grateful for this saint and our Holy Catholic faith.